You’re now in charge of a 50-year-old machine shop that by all accounts successfully served the aerospace and industrial gas turbine industries. Your dad built the business up to include 80 employees making blades, vanes and other critical turbine parts on 100 electrical discharge machines (EDM). You spent every summer since you were 12 years old looking up to your father and preparing for this day by working in every department and learning how to operate the sinker EDM hole drilling machines. So what do your biggest customers say soon after you assume leadership of the company? They need partners with more advanced manufacturing capabilities. They expect suppliers to locate closer to their assembly plants in other states. What’s more, the OEMs want assurances that your business is prepared to help them take advantage of the global expansion of both the aerospace and power-generation markets by increasing production, improving quality and speeding up delivery. Tyler Burke, a career military officer who retired to succeed his father as president and CEO of Turbine Technologies Inc. in Farmington, CT., quickly sized up the new mission. The conversations with Turbine Technologies’ customers led Burke and his new management team to launch an expansion of their own. 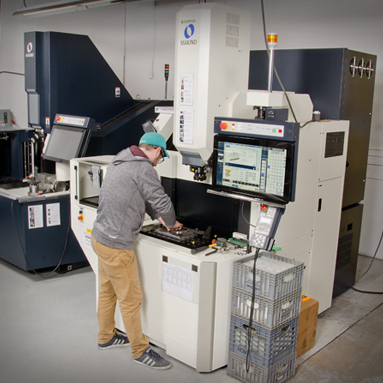 First, they invested in high-performance sinker, hole-drilling and wire EDM machines from Makino in 2015 in their existing shop in Connecticut. They then set up a second shop in Greenville, S.C., in 2016, outfitting it with additional Makino EDM machines and devising new manufacturing processes. Since 2013, Turbine Technologies has made significant investments in Makino machinery to help fuel innovation and meet new OEM requirements for speed, quality and cost. With the capabilities of the Makino EDM machines, Turbine Technologies frequently looks to exceed customer requirements for tolerances and surface quality. Both the EDBV and EDAF machine platforms integrate dielectric reservoirs into the base casting, reducing floor-space requirements while improving thermal stability. Turbine Technologies’ new F3 with graphite package has enabled the company to reduce electrode production times by up to 84 percent for complex, 3-D contoured geometries. The EDBV machines include an integrated 2-axis rotary table for 5-axis positioning required for sloped blade and vane machining, as well as diffuser shapes. Makino’s proprietary back-strike prevention technology detects break-through within one second, or 0.040 inches of depth, when drilling cooling holes. The Hyper-i control provides a unified, intuitive interface for all Makino EDM machines and feature-rich database for testing or troubleshooting programming. Tyler Burke learned a lot about leadership while serving as an Army tank commander in Iraq, and operations officer in Afghanistan. But the most important lessons came not on the battlefield but from civil engineering projects, including the rehabilitation of sewers and municipal trash service in Baghdad. “Being able to, at the drop of a hat, change your mission, learn a new set of skills and do it at a high level is very important in the military; and it has become a part of our culture within the company,” Burke said. Burke is a veteran of two wartime deployments to the Middle East and 20 years split between active duty in the 1st Armored Division, and the Vermont Army National Guard. He retired from the service after he took over as CEO and president of Turbine Technologies; yet the military continues to shape Burke and the ways he leads his company. The management team includes veterans who run operations at the Turbine Technologies’ manufacturing facilities in Farmington, CT., and Greenville, S.C. One of the vice presidents, John Guyette, retired after 30 years in the Vermont Army National Guard. He had been commander of the Army’s Mountain Warfare School. Burke served under him in Afghanistan. Veterans now comprise 20 percent of the company’s employees in Connecticut and 40 percent in South Carolina. The military influence shows up throughout the company and starts with the hiring process. While military service is not a requirement for job candidates, Burke enjoys working with veterans because they share a universal language and set of values that influence the overall company culture. This reduces the time it takes for new employees to learn about the company and procedures, Burke said. When Army combat veteran “Ms. Shim” was hired, she immediately found an environment where her experience as a CH-47 Chinook helicopter mechanic and crew chief in Afghanistan could be immediately applied as Turbine Technologies’ facilities and maintenance manager. That does not mean that Burke and his senior leaders issue commands or that machinists and office staff stand at attention and salute when supervisors enter a room. Employees are expected to do more than follow orders. Central to the military model is that all participants identify challenges, recommend multiple courses of actions, evaluate which action will result in the best outcome, and then implement that action. In 2013, Burke assumed ownership of Turbine Technologies from his father, Robert. Robert is an engineer and entrepreneur with more than 50 years of experience in aerospace and defense manufacturing, and remains a board member and principal advisor to the company. 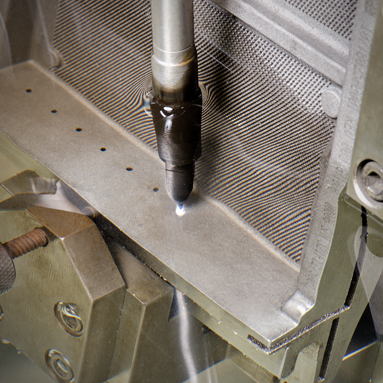 Turbine Technologies produces components for commercial and military applications, typically requiring machining to create profiles and cooling holes in turbine blades and vanes. While the older EDMs in Turbine Technologies’ Connecticut shop still can make parts that meet legacy customer requirements, the company was not equipped to grow with its customers’ expansion plans. “It’s important that we manage the company for long-term growth and stability. That’s discussed nearly every day between my father and I,” Burke said. The gap between the company’s capabilities and customers’ changing requirements led Burke and his new management team to study the latest EDM technology, evaluate machine-tool builders, and spend much of 2014 planning how to invest to win new business opportunities. A key consideration: Burke wanted an EDM platform that prepares Turbine Technologies to automate operations and enables the company to integrate individual machines into manufacturing cells and connect the machines to other business or production systems. In short, Turbine Technologies’ leaders want to participate in the fourth, or next, industrial revolution. Burke intends to not be left behind as machine-tool technology and manufacturing software become networked cyber-physical production systems in the burgeoning Industrial Internet of Things (IIot). “We needed to partner with an EDM machine-tool manufacturer that had these similar values in mind and that is offering a platform that is going to be relevant into the future. It was important to us to know that our machine supplier was spending significant capital on R&D,” Burke said. Those requirements led Turbine Technologies to choose Makino as its sole supplier for EDM machines and SST for consumables. 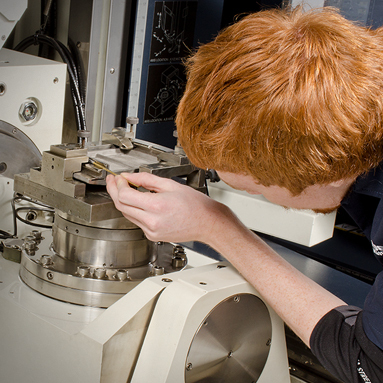 Nearly all manufacturing operations at Turbine Technologies involve an EDM process. 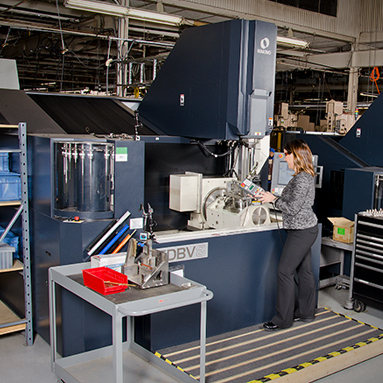 In 2015, the company started by updating its existing 40,000-square-foot Connecticut site with two EDBV3 EDM hole-drilling machines and a larger EDBV8 model—machines specifically designed for the production of cooling holes and diffuser shapes within blades and vanes for the aerospace and power-generation applications. The machines feature a unique tooling system that integrates both automatic tool change and guide changing into one common assembly that can be quickly exchanged within 30 seconds. The EDBV machines include an integrated 2-axis rotary table for 5-axis positioning required in blade and vane machining. Additional features for high-efficiency EDM hole drilling include preprogrammed cycles for diffuser shapes, intelligent electrode length management, and internal water quality and temperature control systems. The EDBV machines employ a 1,000-rpm rotating spindle with high-pressure flushing, and can produce holes down to 0.008 inches (0.200 mm) in diameter. To aid in the reliable performance of small-diameter hole drilling, an automatic middle guide arm supports the pipe electrode during operation and prevents whipping or bending of the electrode. Both the EDBV3 and EDBV8 feature innovative Makino technology that prevents internal workpiece backstriking, and is capable of detecting break-thru within one second or 0.040” of depth. Such technology ensures quality control measures and airflow critical for proper cooling of the part. To achieve that goal, Turbine Technologies employees take a customer’s requirements and set their own higher target for tolerances and surface quality. If a customer asks for cooling holes in a nickel alloy shroud with a true position of no more than 20 thousandths, Turbine Technologies will find a way to drill the holes with a true position of 10 thousandths. About to come online are two more EDBV3s and two EDAF2 sinker EDM machines that integrate the dielectric reservoir into the base casting of the machine, which reduces floor-space requirements while improving thermal stability. Some of the company’s EDM machines date back to the 1960s, but remain in production for legacy aerospace and industrial gas turbine parts. 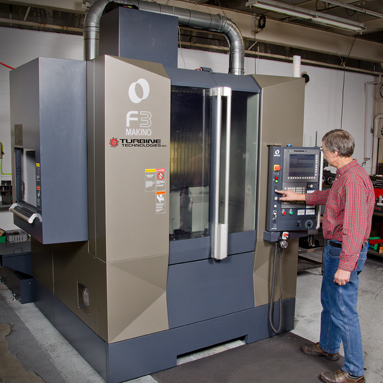 The commodity EDM machines throughout Turbine Technologies’ Connecticut shop each require an operator. All of the Makino machines are equipped with an ATC (automatic tool changer) and standardized pneumatic work-holding fixtures to extend unattended operation. In a new Makino EDM cell, four machines are operated by one employee who loads and unloads parts while a second employee cleans and inspects the parts. The machines can be loaded and unloaded by robots, making further automation possible in order to expand production capacity when the company and customers are ready. Graphite electrodes for the EDAF2s and the company’s legacy sinker EDMs are now being made on a Makino F3 VMC (vertical machining center). 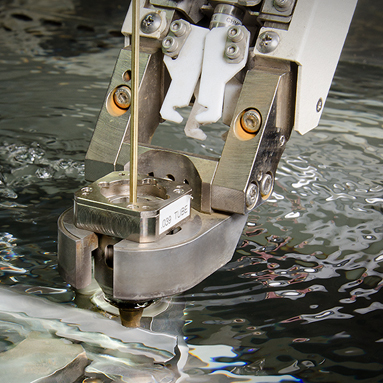 The graphite machining center, added in late 2016 and outfitted with a rotary axis table, provides stiffness and rigidity for chatter-free cutting, agility for high-speed, hard milling and accuracies for tight-tolerance blends, and matches typical of complex, 3-D contoured geometry. Because the F3 is fully enclosed and attached to an air filtration system, graphite dust is now collected, removing it from the machine envelope and improving air quality throughout the shop, which was impossible when using the company’s older open-commodity mills to machine electrodes. Also featured in the F3 is Makino’s proprietary SGI geometric intelligence software—developed specifically for high-feedrate, tight-tolerance machining of complex, 3-D contoured shapes involving continuous tiny blocks of NC data. The SGI software is designed to deliver and ensure production rates faster than standard CNC systems while maintaining high accuracy and smoother geometry blending. Tool Maker Vern Hussey, a machinist with 35 years of experience, said he now programs the F3 to easily cut a radius that previously required manual bench work because the company’s commodity mills could not accurately produce the feature. Productivity in the Connecticut shop also is projected to be improved for jobs requiring larger parts by an investment in a Makino U1310 wire EDM, which provides support and rigidity for workpieces weighing up to 13,228 pounds (6,000 kg). Cycle-time improvement is significant. Makino’s proprietary H.E.A.T. technology, which utilizes two independent CNC controlled flush pumps to dramatically improve flushing efficiency, reduces cycle time and wire consumption. The U1310 also enables Turbine Technologies to consistently achieve a surface quality of 20Ra for the part—far exceeding the customer’s requirement of 80Ra, Engineering Technician Jary Dzierlatka said. The combination of capability allows Turbine Technologies to produce parts faster and with greater accuracy and higher quality levels. In South Carolina, the 28,000-square-foot Greenville shop houses over a half dozen new Makino EDAF3 sinker EDMs located across the aisle from even more recently purchased high speed hole EDMs. The commodity machines were certified for production of an aerospace turbine shroud, which requires a complex hook-shaped feature. “In side-by-side testing, burning the hook shape into the nickel alloy is significantly reduced on the EDAF3s, the cycle time has been reduced while also extending electrode life from four parts per electrode to 16 parts,” Engineering Manager Justin Lamprey said. Working with the aerospace engineering team from Makino and SST, Turbine Technologies expects to continue to improve programming to lower the cycle time for the shrouds, Lamprey said. Also in South Carolina, Turbine Technologies invested in two EDBV8s and several smaller EDBV3 for drilling cooling holes in the shrouds, some with diameters as small as 60 thousandths. All but one of the new machines feature Makino’s new Hyper-i control, a unified control system for all Makino EDM machines that provides intuitive, intelligent and interactive functions with the touch-screen functionality of smartphones and tablets. 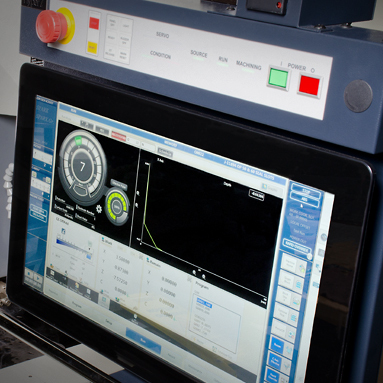 This familiar but powerful and user-friendly interface is one critical reason Turbine Technologies chose Makino as its machine-tool manufacturer. Operators experienced on the company’s older EDM technology have quickly learned to run the Makino machines because the Hyper-i provides simple-to-follow fingertip controls. Machining procedures and how-to videos are immediately available for each setting and process, so the operator does not need to walk away from the 24-inch control screen. Engineers who do not operate the machines on a regular basis can easily use the Hyper-i control to test or troubleshoot programming as well as develop processes for new applications. “I never have to question whether I can do something with these machines. We have to spend months dialing in settings on the older machines. With the Hyper-i control, we are dialed in the first time. We’re up and cutting quickly. We have seven new parts in development. It’s a huge timesaver being able to step up to the Hyper-i to set up and test the programming right on the control,” Lamprey said. What matters most to the leaders of Turbine Technologies is delivering high-quality aerospace and industrial gas turbine parts to customers on time with zero defects. Partnering with Makino and SST to engineer new EDM solutions that make the most efficient use of the company’s investment in advanced sinker, wire and hole-drilling technology is a central part of Turbine Technologies’ growth strategy. Since implementation of the machines in both Connecticut and South Carolina, Makino and SST engineers and technicians are promptly available by phone and email and in person whenever needed to assist Turbine Technologies as its team plans how to produce parts now in development. “Our customers want to see their hardware conforming to specified requirements, that we get it to them on time, and with cost alignment. We are able to do that because the Makino machines have operated exactly as they were promised to us,” said John Guyette, vice president of operations for Turbine Technologies in South Carolina.